Null Nomine Daunce, Mike Ruff's group perform music and dance from late Middle Ages to 17th Century. Ideal for Medieval themes or events in historical venues. The power of the ceilidh with the romance of history. 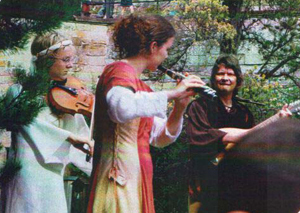 Ideal for re-enactment groups, historical venues, or just something different, Null Nomine Daunce adds music and dance from the late Middle Ages to 17th Century with wandering minstrels, historical dancers, top musicians and powerful stage performances. People through the ages have always danced for fun – the expertise follows later. There are dances for all ages and abilities taken from the archives, dusted off and made accessible to all. Null Nomine Daunce also give specialist workshops for those who want to practice beforehand. Dancing master Mike Ruff – professional musician, dance teacher, historical dancer and wandering minstrel. Master of Ceremonies Tom Brown. Musicians are all professionals selected with your particular event in mind.